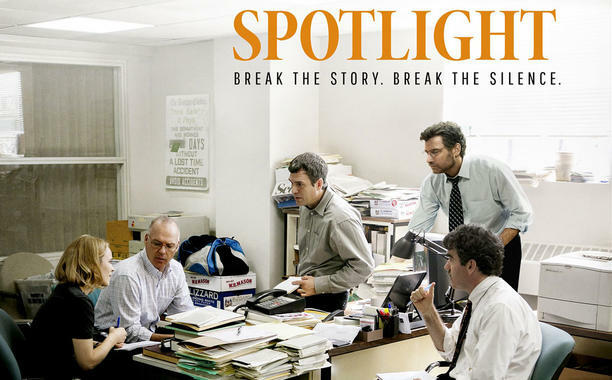 “Spotlight”, the newly released film directed and co-written by Tom McCarthy, tells the true story of The Boston Globe journalists that uncover the scandal of wide-spread child molestation by Massachusetts’ Catholic priests in 2002. Now nominated for 6 Oscars including Best Picture, the film follows reporters on the “Spotlight” team, which handles in-depth, investigative pieces for the paper, as they attempt to expose systematic abuse covered-up by the local Catholic church. In Boston, a city known for its Catholic influences, the journalists encounter various obstacles. The story begins with the addition of new editor Marty Baron, played by Liev Schreiber, who insists on follow-ups concerning a column released in the paper about a local priest charged with abusing children. When he gets “Spotlight” to investigate the incidence, journalists Mike Rezendes (Mark Ruffalo), Walter ‘Robby’ Robinson (Michael Keaton), Sacha Pfeiffer (Rachel McAdams), and Matty Carroll (Brian d’Arcy James) uncover more abuse and cover-ups than anyone had imagined, citing around seventy cases of abuse in Boston in their article published the year after their investigations begin. They also find the concealment of the abuse to be aided by various city officials, including individuals associated with their own paper. It’s only when Baron, who is neither from Boston nor Catholic, takes charge of the paper that the issue is really pursued. Although it may seem slow to some, “Spotlight” does an incredible job of showing the details of how the reporting team uncovers their story, with numerous scenes showing interviews, phone call after phone call, and extensive researching. Time and time again the team’s progress is slowed, whether by uncooperative lawyers or the tragic incidence of 9/11, which results in numerous journalists being called away from their pieces, and the frustration is palpable as the film plays out. Although not disturbing in the sense that scenes are included portraying molestation or abuse, “Spotlight” will surely leave any viewer uncomfortable. From a scene in which a victim breaks down recalling what happened to him to a scene in which McAdams’s character asks who appears to be a mentally-ill priest if he’s ever molested a child, the film will have you on the edge of your seat, all with the disturbing knowledge that the story is true. “Spotlight” does a good job of slowly unveiling the magnitude of the story in a way that will make your stomach turn, and the actors, especially Ruffalo, do an incredible job of mirroring this disgust in the film. The film is heavy, thought-provoking, and appropriately unadorned, much like the piece which exposed the abuse in 2002 and earned The Boston Globe a Pulitzer Prize in 2003. It does a good job of showing the lengths journalists went to to report it, and tells a story that needs to be told. Although it won’t leave you happy or satisfied, with the end of the film including a black screen with a troubling, long list of cities which have had the same types of trends of abuse as unveiled in Boston, “Spotlight” is a must-see film.